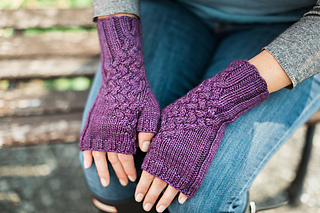 Sultry cables in a lush worsted weight add captivating elegance to already cozy accessory. 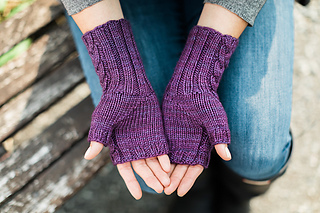 Worked from cuff to fingers and using only one skein, these fingerless mitts are a dream for every autumn wardobe. 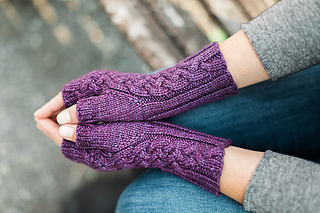 These fingerless mitts are worked in the round from the cuff with a thumb gusset. After setting aside the thumb stitches, the rest of the hand is worked in the round. 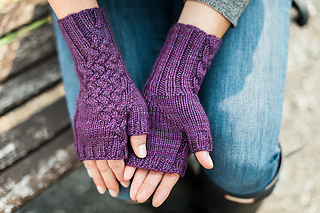 The cable pattern is mirrored on the back of the right and left mitt. The stitch patterns are both written (see Stitch Instructions) and charted (see page 4) for your preference. Please note that the pattern went through a significant edit, so ensure you have the 2.2 version to reflect the changes. 24 sts and 28 rows = 4” / 10 cm in cable pattern, after blocking. 20 sts and 32 rows = 4” / 10 cm in Stockinette stitch, after blocking.